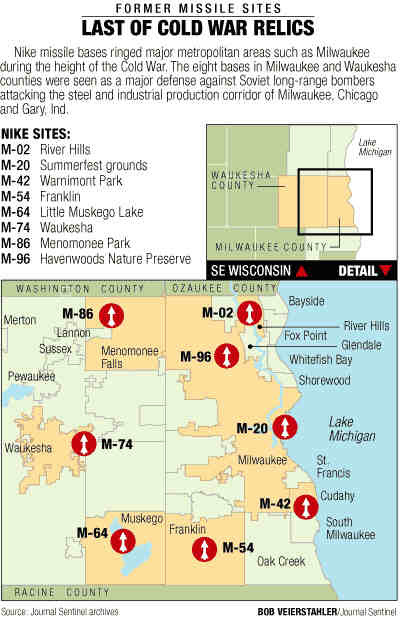 The color image below was printed in the Milwaukee Journal / Sentinel a number of times with articles about the Nike Sites surrounding Milwaukee. The site locations as shown in the article are correct, but they are not named as we knew them. 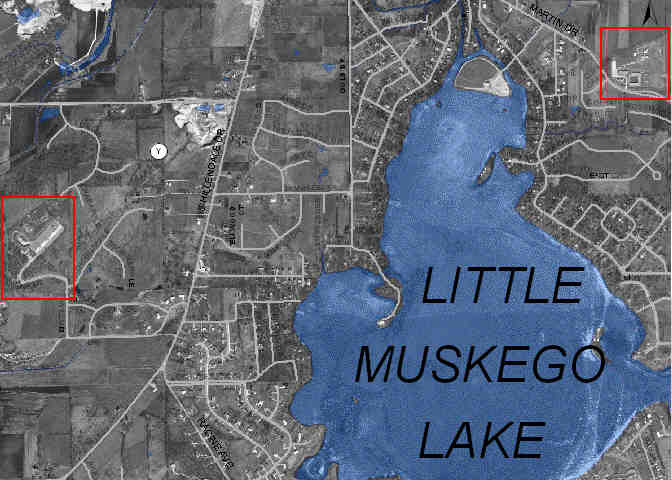 M-02 was our Brown Deer; M-20 was our Lakefront; M-42 was our Cudahy; M-54 was our Hales Corner; M-64 was our Muskego; M-86 was our Lannon; and M-96 was our Silver Springs. I include this for those who may be trying to find to the sites as we knew them. 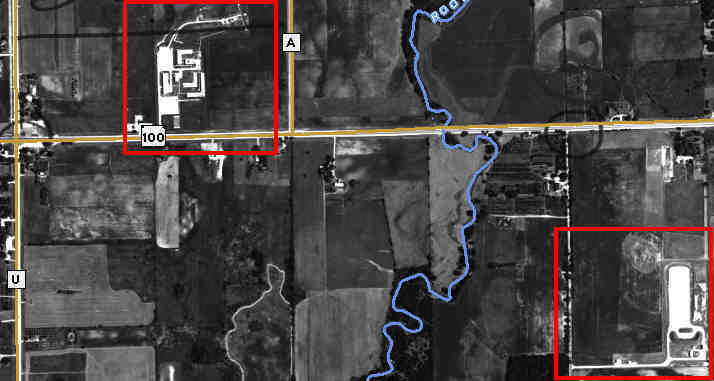 The image below is our Brown Deer Site, M-02. It is Brown Deer (not River Hills) because of the postal address of the times - not because of Brown Deer Road. 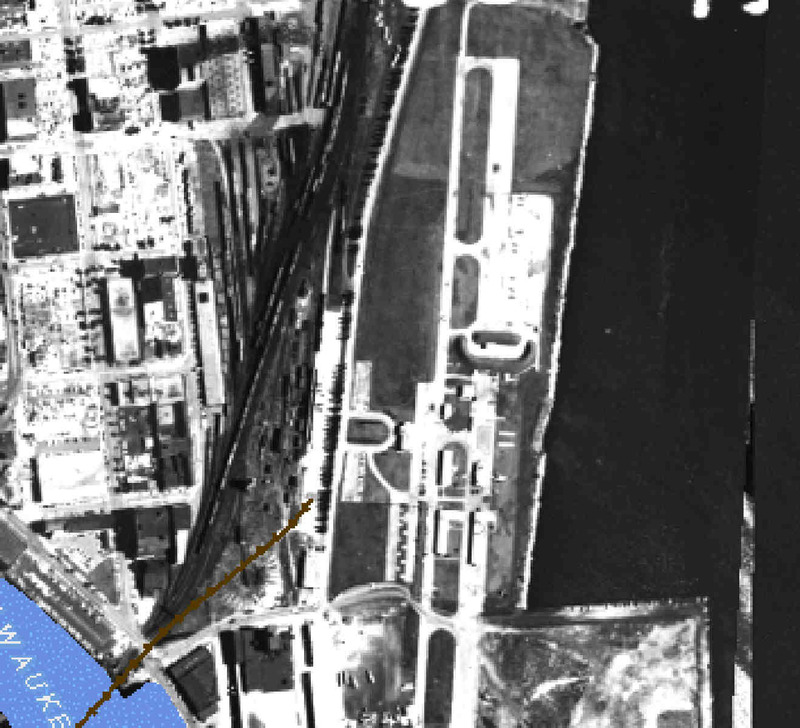 The red box outline at the lower left is the Headquarters and IFC (radar) area. The red box outline to the right is the Launcher area with 3 magazines on angle in the upper area of the box. 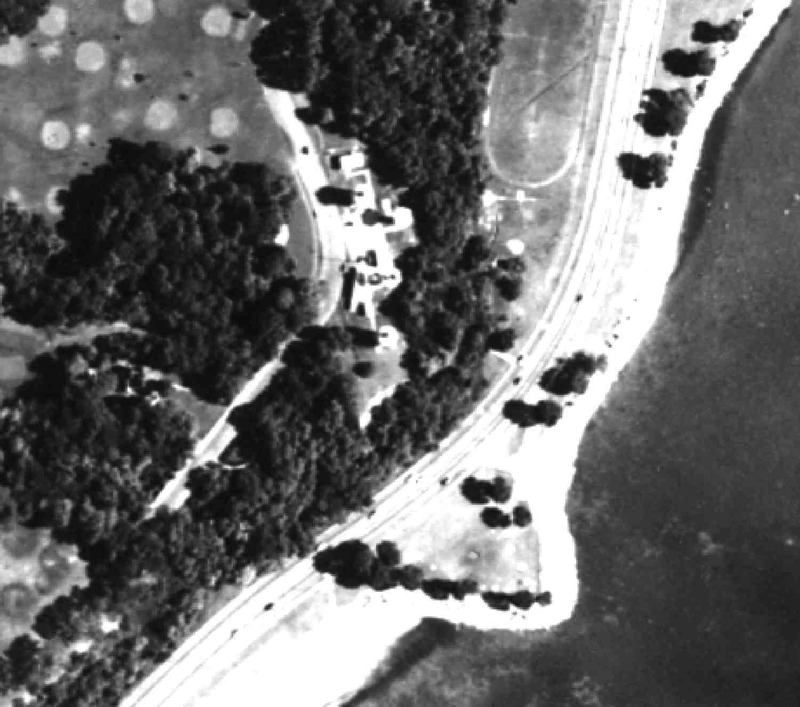 The two images below are the Lakefront site M-20. 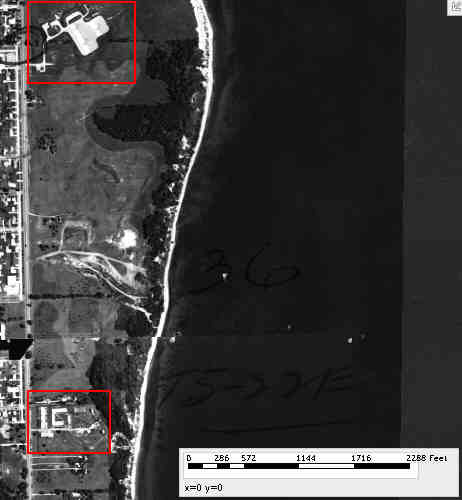 The top image is the IFC (radar) site which was located on the bluff in Lake Park. It was north of the light house and east of the statue. The lower image is of Maintland Field which was the location of the Headquarters and Launcher Area. 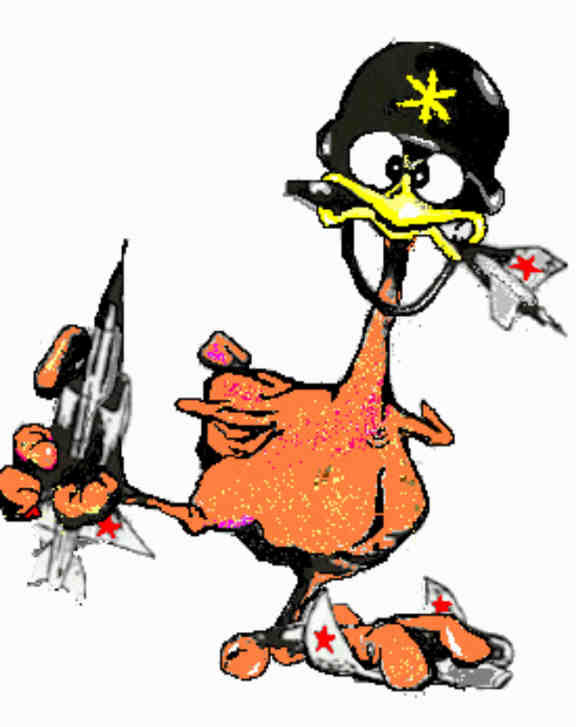 The image above is the Cudahy site M-42. 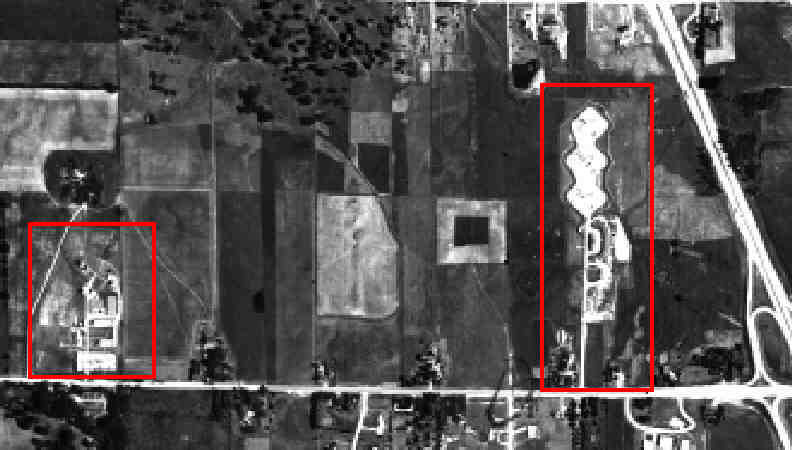 The lower red box is the Headquarters and IFC (radar) area - it is now in use as a senior center (located just north of College Ave). The upper red box is the Launcher Area. The sites numerical designation was based on location from the center of the Defense Area rotating clockwise from North. M-02 was at about 7.25 degree from due North; M-96 was at about 350 degree clockwise from due North. M-20 was at about 73 degree from due North (nearly due east) and M-74 was at about 270 degree clockwise from due North (due west) in relation to the center of the Defense Area. The image below is our Silver Springs site M-96, the 61st Artillery Group Headquarters, a Battalion Headquarters, and the Army Disciplinary Barracks (USDB). The red box on the right is the USDB. The red box on the left is the Launcher Area of Site M-96. The IFC (radar) area is not identified in this image. 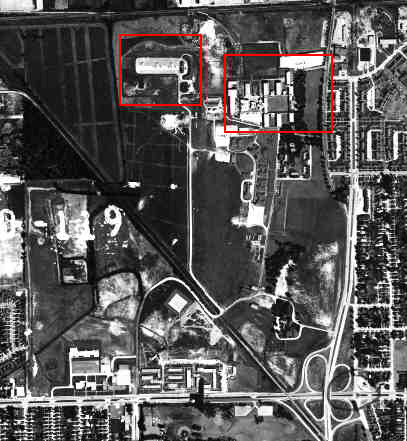 Group Headquarters is in the lower mid portion of the image, just above Silver Springs Drive. The image above is our Hales Corner site M-54 and a Battalion Headquarters. The City of Franklin came later. The physical location of the site would have been the Town of Franklin with a postal address of Hales Corner. The upper left red box is the location of the Site (Battery) Headquarters and IFC (radar) area. The Battalion Headquarters was also at this location. The Milwaukee Defense Area was the 61st Artillery Group composed of two Battalions each having four Batteries. Each Battery was located on a firing site. The Silver Springs location included a firing battery (M-96), a Battalion Headquarters and the 61st Group Headquarters. The Hales Corner site was also the location of the other Battalion Headquarters. The image below is the Lannon Site M-86. 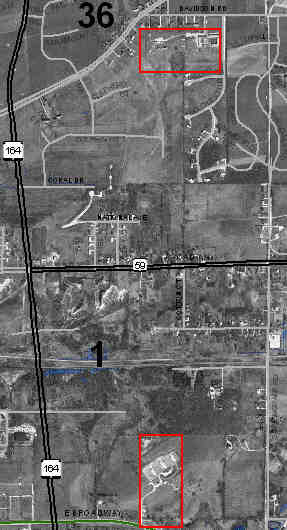 The green line follows Cty Hwy Y north of Hwy 74. The top red box is the Launcher Area. The lower left box is the Site Headquarters and the lower right box is the IFC (radar) Area. The image below is the Waukesha Site M-74. The top red box is the site Headquarters and IFC (radar) Area. The lower red box is the Launcher Area. This image shows the Hwy 164 bypass, however that road was constructed much later than when this photo was taken. This is a very busy page. We will link the images of each site to a site page in the future so that we can go into detail about each location. If you have anything to contribute to a site page please e-mail it to us. Do check back. When the link is set up we will post a notice here. 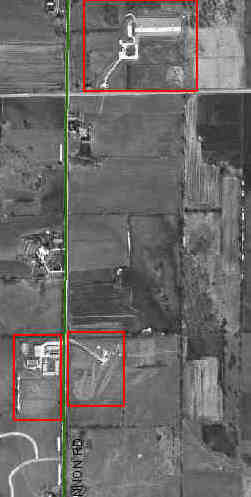 The image to the right is the Muskego Site M-64. With the lake in the middle it was too difficult to reduce the image size and maintain any detail. On the lower left is the Launcher Area. On the top right is the Headquarters and IFC (radar) Area.